“Our software and Japan’s hardware can do wonders” Indian Prime Minister Narendra Modi declared. In scenic Yamanashi, where Japanese Prime Minister Shinzo Abe and his Indian counterpart Narendra Modi met over a private dinner and a brief tutorial on the use of chopsticks, there was a clear sense of bonhomie and trust. The 13th annual meeting between the leaders of the two countries included a visit to a Fuji Automatic Numerical Control (FANUC) factory. Deep in the forests near Mount Fuji, the largest industrial robot manufacturer in the world showcased products that help keep the assembly lines of some of the leading global brands, including Apple, running. The visit was significant, not only because it showed growing bilateral cooperation in emerging technologies between India and Japan, but also because it highlighted the shift toward leaner, more globally competitive, manufacturing aided by automation, artificial intelligence (AI), and the creation of new skills sets. There are other implications too: increased cooperation in areas including defence, as evident from the goals of co-development and co-production in the Japan-India Vision 2025. In July 2018, the two sides agreed to collaborate on dual-use technologies to strengthen defence cooperation, including research on unmanned ground vehicle robotics. 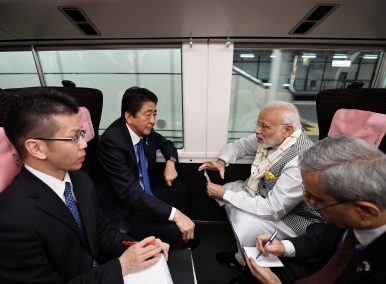 Modi highlighted this aspect of bilateral ties when he claimed Japan to be India’s most trusted partner in economic and technological modernization, and that “[India’s] software and Japan’s hardware can do wonders” to a gathering of businesspersons in Tokyo. What lent credence to the rhetoric was that he has met Abe 12 times since taking office in 2014. It heralds a clear attempt to boost investments and move toward “Industry 4.0” that will be increasingly driven by automation, the internet of things (IoT), 3D Printing, AI, robotics, and 5G technology. In terms of investment, Japan has been India’s third largest source of FDI, providing $28.16 billion from April 2000 to June 2018, in diverse sectors. In 2014, Japan committed $462 million in government and private sector investments over five years. The first instalment of the $15 billion earmarked for the Ahmedabad-Mumbai bullet train service, expected to be completed by 2022, has been released. The capstone of Japan’s investment is the $90 billion Delhi-Mumbai Industrial Corridor, spread across six Indian states, which will involve building new cities, industrial parks, ports, airports, and a 1,483 km high-speed rail and road line. Both governments are expected to contribute equally to the project. For Japan, there is high return on investment, not only in terms of big-ticket infrastructure projects, but securing access to a booming export market for its merchandise trade. The Indian market provides an attractive alternative against the backdrop of Japan’s exports dipping for the first time since 2016, following the trade war between the United States and China. The enablers for boosting bilateral trade in goods and services, including the removal of tariff on 94 percent of tradeable items, are laid out in the Comprehensive Economic Partnership Agreement implemented in August 2011. The Japanese ambassador to India, Kenji Hiramatsu acknowledged India’s improvement in the World Bank’s ease of doing business ranking. Japan is a leading partner in India’s “Make in India,” “Start-up India,” “Skill India,” and “Digital India” initiatives. Many Japanese companies have relocated to India to support Make in India. Japan’s hardware in the form of cars and electric appliance markets can complement India’s software in terms of skilled personnel. With both India and Japan aiming to shore up the start-up sector, in May 2018 the Japan-India Start-up hub was established in India’s I.T. capital, Bengaluru. Many startups aim to service the manufacturing sector with frontline technologies. The Indian government will help Japanese companies find local partners. Japan will invite Indian start-ups with competitive technologies to collaborate with large Japanese companies. Japan’s largest state-sponsored research institute, the National Institute of Advanced Industrial Science and Technology, and the Indian Institute of Technology, Hyderabad, will be working on joint studies in image recognition and might later work on 5G wireless communications. Several Japanese venture capitalists like Soft Bank Group Corp. (has committed to invest $10 billion in the Indian market by 2024), Incubate Fund, Beenext, Anew Holdings, Rebright Partners, GREE Ventures, and Mistletoe are increasing their Indian portfolios. Japan plans to start a one-year visa programme to attract skilled Indians. The meeting between Modi and Abe marks a progression in diplomatic relations between the two countries. Their engagement on a range of global and regional issues, including maritime cooperation in the Indo-Pacific region, could provide a counterpoint to Chinese dominance in the region. Technological and economic cooperation can bolster these efforts. Dr. Sangeeta Mahapatra is a visiting fellow at the Institute of Asian Studies, German Institute of Global and Area Studies, Hamburg, Germany. Pacific Money hands out some presents to the political winners and losers across the Asia-Pacific in 2016.